Whatever business you choose as your own, your first step should be to acquire Commercial General Liability Insurance. By making this your first priority, you are making this the first line of bdefense in protecting your business interests. 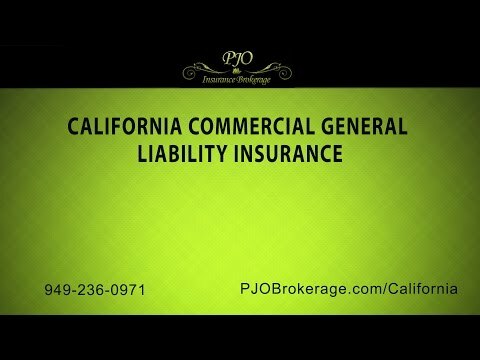 With access to various markets and PJO Insurance Brokerage in California’s vast experience, we feel we can find the proper coverage and policy limits whether you a small or medium size business, consultant, have a home based business or one of the many contractor class policies we write. Also, with the array of insurance products we offer, we can protect other aspects of your business. More times commercial general liability insurance is required for all providers. It can protect against many different risks that corporations are subjected to, like lawsuits for things covering anything from property damage to health insurance to covering the cost of settlement bonds, which may be needed in the case of a summary judgment against your business. Also, in the event that incident/injury were to happen due to an irresponsible act, this insurance coverage would most likely protect your company. Commercial general liability insurance policies are broadly varied in price, taking into account which risk classification the underwriter assigns it. In most cases, the premium paid for your insurance will likely be a percentage of profits,because the level of your business operations determines the level of risk it should be covered against. Liability Insurance can come in many forms. PJO has employment insurance polices to cover owners from lawsuits for such events as discriminatory or unfair hiring practices, unfortunately in today’s business world a common source of lawsuits. California General Liability insurance is a good starting point when it comes to protecting any entity. We invite you to contact PJO either by email or calling us at 949-354-0789 so we can put a detailed plan together for your California business.